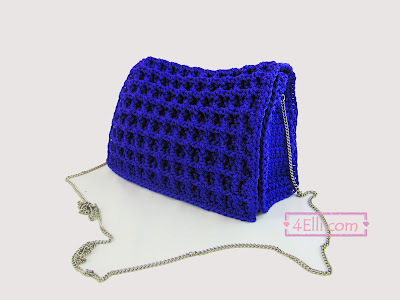 How to crochet a handbag with Waffle stitch!! Materials: Polypropylene yarn (or paracord 365), 4,25mm crochet hook. The pattern is for medium size bag. Row 2: chain 1, turn, *1dc in each of next 2, 1front post dc into the next* repeat from * to * until 2 stitches remain. To finish the row: 1dc into the next, 1dc into the last on top of turning chain. Row 3: chain 3, turn, skip the 1st (the turning chain counts as the 1st dc) 1front post dc into the next, *1dc into the next , 1front post dc in each of next 2* repeat from * to * until 3 stitches remain. To finish the row: 1dc into the next, 1front post dc in each of last 2. Row 15: chain 1, turn, 1sc in each stitch across. In the end of row 53 work 1 round: 1sc in each stitch around, 1slip stitch in each stitch in the bottom. In the end of round cut the yarn and finish your work. Join the sides with the bag with 1 sc in each stitch arround.